Last week, a coward and a terrorist committed a vicious, pre-meditated hate crime against an innocent group of people as they gathered to worship. He sat with them for an hour while they prayed and admitted that they did their best to make him feel welcome, and still he had enough hate in his heart to aim his gun first at an 87 year old woman, Susie Jackson. His stated goal was to ignite racial tensions, but still there are those who would seek to deny and downplay those motives. It’s sparked a deluge of intense articles that delve into the issues of racism and gun control that need to be addressed in America. It’s resulted in a plethora of thinkpieces examining the murderous terrorist’s upbringing and mental state. It has sparked a necessary debate into the symbols of the past and their effect on the present. It has shone a super bright light on social media – it’s been downright fascinating to see who’s affected and who’s blithely able to ignore the news. It’s almost been a week. A church family grieves. Blood relatives and lifelong friends are heartbroken. All of the fissures and cracks in a society that has tried to hide, cover and deny the existence of, are exposed. All of the dirt that has been swept under the post-racial rug is swirling in the air and choking us. And in the arising cloud, I fear that the original victims are being forgotten. I want to remember them. Honestly, I’ve seen entirely too much of the murderer on my timeline. I really don’t want to know about his childhood, his influences, or how lonely and isolated he was. I don’t want to see his creepy, vacant gaze staring at me through the computer screen anymore. I don’t need to see the face of evil. These are the faces I want to remember and these are the names I plan to hold in my prayers at night. The Rev. Depayne Middleton Doctor. In the midst of all of this, it feels too soon and too raw to be able to forgive as the families have done. I respect them for their strength of faith and ability to come forth and speak of forgiveness in the immediate face of such intentional, awful loss. 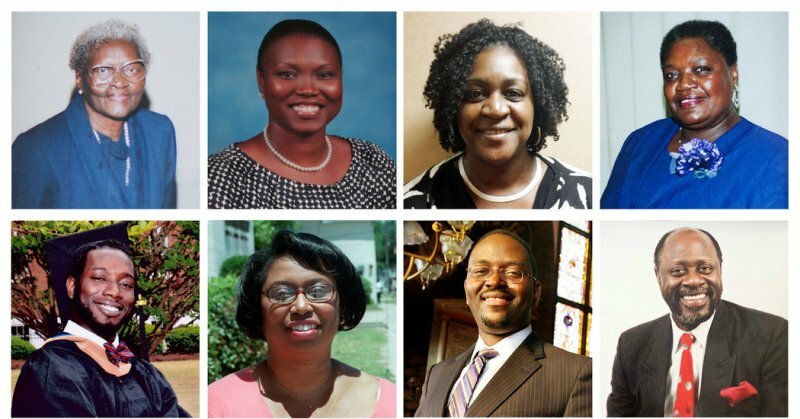 Right now all I can try to do – me, personally – is try to find inspiration in how the Charleston nine lived. They found strength in their faith. They gathered to study the Bible and to pray on a Wednesday evening. They found guidance and inspiration in each other, men and women ranging in age from 26 to 87. They found in themselves to welcome a stranger into their midst. There is grace and strength and real beauty in the way they lived their lives. That in itself, is an inspiration. There is helpful info on how you can donate to benefit Emanuel AME Church and those affected, via the city of Charleston’s official site. 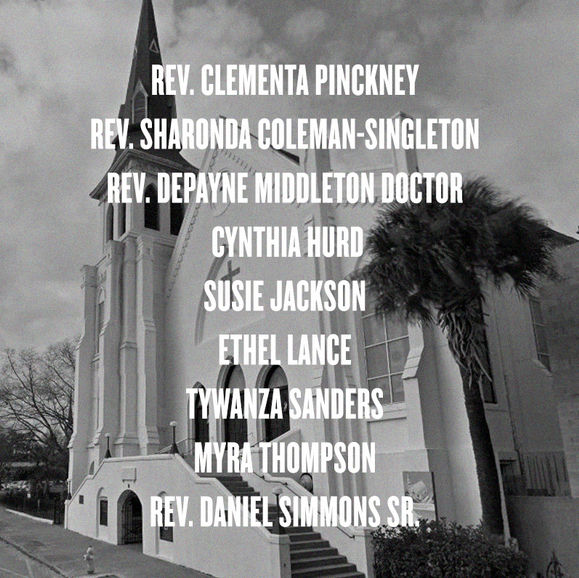 Please click here to donate directly to Emanuel AME. Please join me in sending love to the families and the good people of Charleston. Black Churches Taught Us to Forgive White People, We Learned to Shame Ourselves by Kiese Laymon – such incredible writing that aches to read. If you’ve written or read anything on this topic that you think is truly moving and worth sharing, please include the link in my comments. Look at the contrast of the university graduate in his 20s slain by a 20s high school educated not going anywhere in his life person. Look at the youngest Senator/Pastor of the church. Look at the many women he felled with multiple bullets. The slain were being good role models to their families, church and community. Thanks for memorializing them in this way and may God have mercy on them and all who have been touched by such pain and sorrow. All this young man had to do was to get educated and make something of himself. Simple. He would be too tired studying for finals to think crazy. He would be too exhausted from work to consider anything stupid. He wasted his own opportunity but turns around and blames blacks for his woes. Cry me a river! Thank you so much for speaking of the victims instead. I read a full bio on each victim and it makes the sting felt even more.